The chamber is named for the Danish physiologist Hans Ussing (1911-2000), who invented the first one in the 1950s. 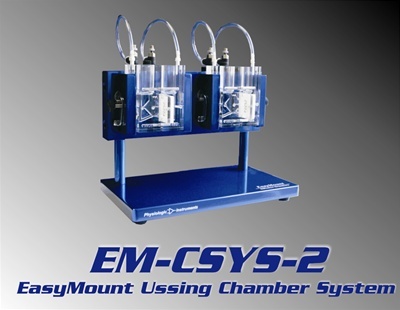 An Ussing chamber is a scientific tool used to measure the short-circuit current as an indicator of net ion transport taking place across an epithelium. Ussing chambers are increasingly being used to measure ion transport in both native tissue, like gut mucosa and monolayer of cells grown on permeable supports. An Ussing chamber consists of two halves that are clamped together having the epithelia (sheet of mucosa or monolayer of epithelial cells grown on permeable supports). Note: Epithelia are polar in nature, i.e., they have an apical or mucosal side and a basolateral or serosal side. Thus in an Ussing chamber it is possible to isolate the apical side from the basolateral side. The two half chambers are filled with equal amount of symmetrical Ringer solution in order to remove any chemical, mechanical and electrical driving forces. In any epithelium there is ion transport taking place across it be it from apical side to basolateral side or vice-versa. This ion transport produces a potential difference (voltage difference) across the epithelium. The voltage difference generated is measured using two voltage electrodes that are placed nearer to the tissue/epithelium. And this voltage is cancelled out by injecting the current using another two current electrodes that are placed away from the epithelium. This amount of current injected is called Short-circuit current (Isc) and is the exact measure of net ion transport taking place across the epithlium. The epithelial ion transport is the factor of greatest interest in research involving Ussing chambers. The voltage that is measured as the voltage difference is a result of this ion transport and the voltage difference is easy to measure accurately. The epithelium pumps ions from one side to the other and the ions leak back through so called tight junctions that are situated between the epithelial cells. In order to measure the ion transport an external current is applied as described above. However by canceling the voltage as described above you get an underestimation of the true ion transport. What you do is to short circuit at the voltage measuring electrodes and not at the epithelium itself. The resistance between the voltage electrodes external to the epithelium has also to be accounted for in some way.